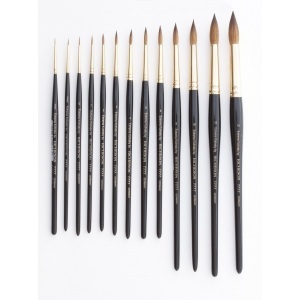 Over the years, we have observed a shift in the quality of Fine Artist Brushes. As the market drives prices down, eventually a lowering of quality can occur. Richeson has sought out the world’s finest brush maker to produce a Kolinsky watercolor brush that will exceed the dreams and demands of the most discriminating painter. Each brush is carefully created by hand using only the highest possible percentage of male hair.